The Iowa Barnstormers were close to upsetting the Dallas Vigilantes last week in conference action but were unable to clinch the win. Dallas came out with a quick 13-point lead in the first quarter of the game. The Barnstormers were able to keep up in the second quarter but still entered the half time mark down 34-20. After the half, an inspired and ignited group of Stormers’ took the field to score 15 straight points to take the lead over Dallas. However, the fire didn’t last long as the Vigilantes bounced back to finish the game with a ten-point victory over the Barnstormers and improving to an 8-5 record for the season. 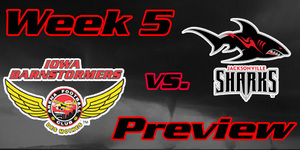 The Iowa Barnstormers (3-10) travel to Chicago this weekend to battle the Rush (9-4) in another conference match-up. This will be the second time this season the two teams have met on the turf. The last battle was back in April when the Barnstormers jumped to a quick 21-7 lead in the first quarter, only to lose by one point in the final seconds of the game. The Rush remain the number one seat in the conference with just one more win than Dallas. Chicago will bring a rowdy defense to the arena, led by Vic Hall, who also leads the league in interceptions. The Chicago Rush posted their first loss last week, after a four-game winning streak, as they fell to the Spokane Shock by a mere three points. The game started out like a tennis match, with each team exchanging scores. In the second quarter, the Shock managed a 15-point lead to take them into the locker room up 42-27. Although the Rush persevered for a fourth-quarter comeback, they were just short of victory. The Shock took the game with a 63-60 win over the Rush and improving to a 6-7 record for the season. Iowa Barnstormers vs Chicago Rush will be broadcast LIVE on 1700 AM The Champ, on the Internet at www.theiowabarnstormers.com and at www.nifty-tv.com. -This will be the third meeting between the Iowa Barnstormers and the Chicago Rush in their franchises’ history. Chicago leads the series 2-0. In his first game back since getting injured in the Jacksonville Sharks game one month ago, Todd Blythe had a shinning performance against the Dallas Vigilantes last week. While he only tallied 7 total receptions, he had the crowd on their feet with 2 incredible touchdown passes, including a 37-yard completion pass in the end zone. Todd is ranked 6th in the league for receiving yards per game with 111 yards and total scoring, averaging 16.4 points per game.